This paper analyzes performances of the Pulse Interval Modulation (PIM) scheme for impulse radio ultra-wideband (IR-UWB) communication systems. Due to the PIM anisochronous nature, a tap delay line (TDL) coded division multiple access (CDMA) scheme based on strict optical orthogonal codes (SOOC) is proposed. This scheme is suitable for multiuser high-speed data asynchronous transmission applications because the average symbol length is shorter than in Pulse Position Modulation (PPM) schemes and it needs only chip synchronization. The error probability over the additive white Gaussian noise (AWGN) channel is derived in the single- and multi-user environment and compared with other modulation schemes. Trends in modern communication systems place high demands on low power consumption, high-speed transmission, and anti-interference characteristics. Therefore, impulse radio ultra-wideband (IR-UWB)  systems have recently gained increased popularity. Since IR-UWB symbols are transmitted by short pulses ( 2 ns), energy has spread over the frequency bands of up to 10 GHz. These pulses have to follow strict regulations concerning power and spectrum restrictions defined by local authorities, like the Federal Communications Commission (FCC)  in the USA. Because of power and spectral properties of the transmitted IR-UWB pulses, different types of orthogonal pulse shapes are used to provide a higher spectral efficiency [3, 4]. Derivation of the Gaussian pulse and modified Hermite pulses (MHPs), usually called Hermites , provides a wide range of various pulse combinations for IR-UWB transmission and for that reason they are most commonly used as pulse shapes. The state of art in IR-UWB systems is presented by many applicable modulation techniques like Pulse Amplitude Modulation (PAM), PPM, Pulse Shape Modulation (PSM), on-off-keying (OOK), and biphase modulation (BPM). A combination of the exposed modulation techniques (hybrid techniques) can provide system improvements in terms of the error probability, a higher data rate, a less complex receiver, or less power consumption. Many hybrid techniques for IR-UWB communication systems have been applied recently, such as Pulse Position Amplitude Modulation (PPAM) , Biorthogonal Pulse Position Modulation (BPPM) , OOK-PSM , PPM-PSM , and hybrid Shape-Amplitude Modulation [10, 11]. Regarding pulse amplitudes, positions, and shapes, three types of modulations can be distinguished. In PAM and OOK modulation information is contained in the amplitude of the signal, PPM uses the position of the pulse to convey information, whereas in PSM, information is conveyed in the shape of the pulse. PIM was first introduced in  for wireless optical communication systems. It is interesting because it displays a higher transmission capacity by eliminating unused time chips within each symbol and does not require both chip and symbol synchronization, but only chip synchronization, since each symbol is initiated with a pulse. 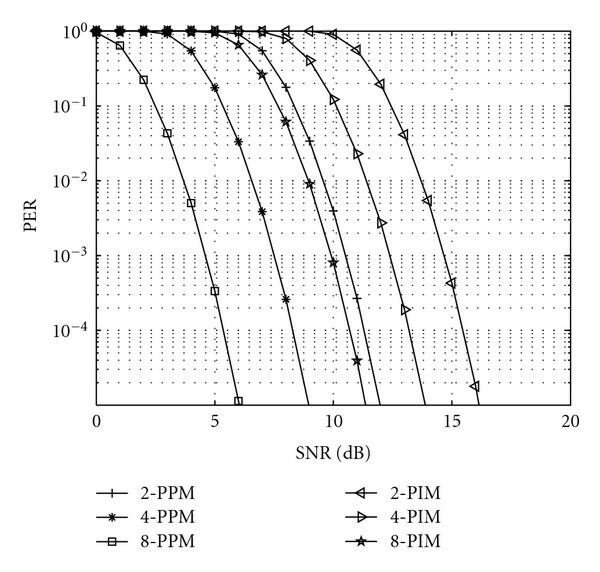 Different anisochronous and synchronous pulse time modulation (PTM) techniques for optical short-range wireless communications are compared in . This paper is organized as follows. Section 2 describes basic properties of the PIM scheme. In Section 3, the proposed system model is described, while in Section 4 error performance analysis is made over the AWGN channel. Section 5 gives simulation results while some conclusions are given in Section 6. PIM is part of anisochronous PTM techniques. The main characteristic of anisochronous schemes is that they do not have a fixed symbol structure, which means that the symbol length varies and is determined by the information content of the symbol. In PPM, each symbol has a fixed length and the chips following the pulse are redundant, while in PIM that redundancy is removed. A PIM symbol which encodes input bits, where is the number of symbols, is represented by a constant power pulse in the "ON" chip followed by the ( ) "OFF" chips. In order to avoid symbols in which the time between adjacent pulses is zero, an additional guard chip may also be added to each symbol immediately following the pulse. Table 1 shows the transformation of the source bit sequence into PPM chip sequences and PIM chip sequences with the guard zero chip. Mappings between source bits and transmitted chips for 4-PPM and 4-PIM (Example). respectively. The dependence of the symbol length and the average power ratio ( ) on the number of bits per symbol is shown in Figure 1. 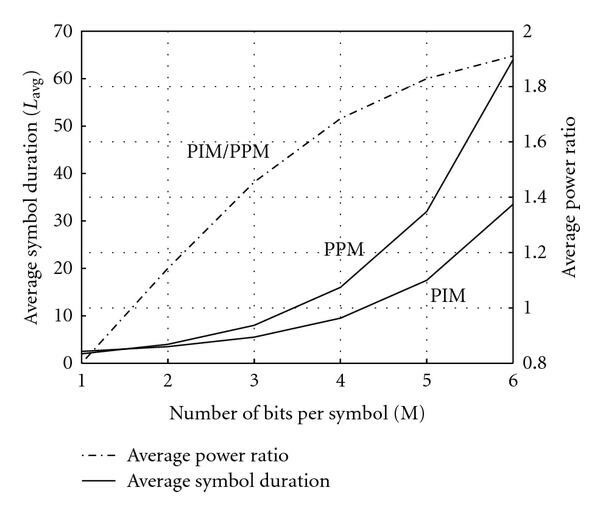 Dependence of symbol duration ( ) and average power ratio (Pow PIM /Pow PPM ) on the number of bits per symbol. Figure 2 shows an example of PPM and PIM symbols for the sequence of source bit combinations 01 and 10. PPM and PIM symbol structure for the sequence of source bit combinations 01 and 10. In this section, the performance of PIM in a multi-user environment is derived for IR-UWB communication systems. Due to the PIM anisochronous nature, CDMA based on the TDL is proposed in . This scheme is suitable for IR-UWB systems because it needs only chip synchronization, while the time-hopping systems proposed in [6–11] need both frame and chip synchronization which increase hardware complexity. Figure 3 shows a TDL-based transmitter and receiver. Proposed (a) transmitter and (b) receiver. where is the number of users, is time delay of the k th user (assumed to be the integer multiple of ), and is an AWGN component with zero mean and variance /2. 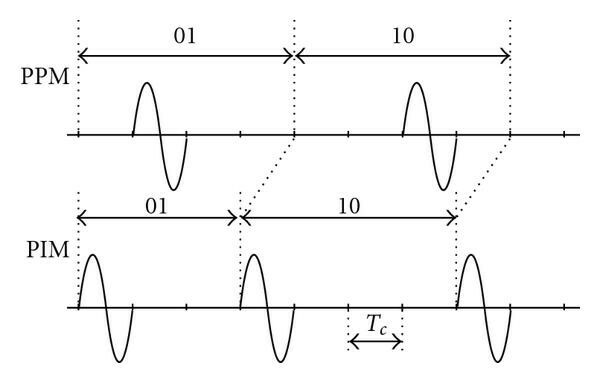 At the input of the receiver, is passed through the TDL decoder, where by tuning the delay elements a higher amplitude pulse can be formed by each of the pulses in the signature sequences. The decoded signal is then fed into the correlator-based matched filter which multiplies the signal by the template waveform. The decision which chip is empty and which chip contains a pulse is made on the basis of autocorrelation properties of the Gaussian monocycle at the threshold detector. At the output of the threshold detector, the transmitted PIM data encoded stream is estimated by removing redundant ( ) chips. The pulse at the start of the PIM symbol is then used to load the output of the counter in the latches and to reset the counter. Figure 4 shows an example of the PIM symbol with the (7, 3, 1, 1) SOOC signature sequence. PIM symbol (a) before the TDL encoder, (b) after the TDL encoder, (c) after the TDL decoder. In order to derive the error probability, some simplification has been assumed. Channel model is an AWGN channel (no multipath components). MUI is approximated as a Gaussian random variable. There is a perfect synchronization and power control between the transmitter and the receiver. where is the channel bandwidth and is the bit rate defined in (2), (3). The error probability given by (18), (24), and (25) is compared with Monte Carlo simulation  in Figure 5 for three different PIMs and the packet length B = 128. It can be seen that the derived error probability matches simulation results for 4-PIM and 8-PIM, while for 2-PIM there is a slight difference for large . Comparison of PER performance between Monte Carlo simulation and the derived error probability for B = 128. In order to compare PIM with PPM and PAM, packet length is chosen to be B= 512 bits, w = 1, and PER performance of PIM is obtained using (18), (24), (25) and the results are shown in Figure 6. In the simulation, the number of modulation levels is L= 2, 4, 8. 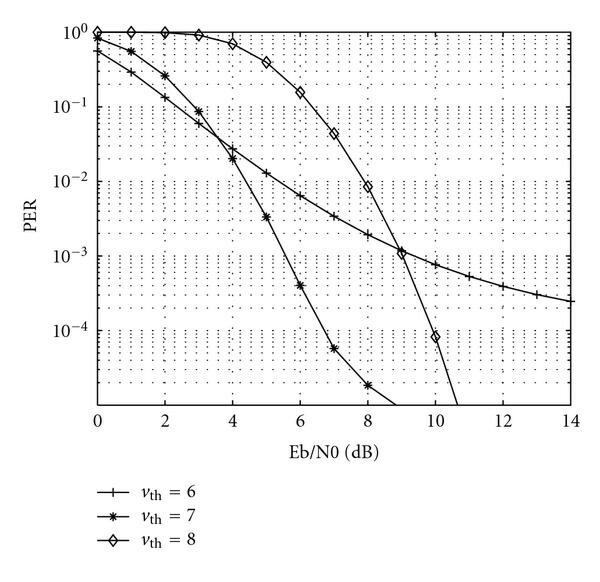 In the case of L = 2, PIM has a 6 dB and 3 dB worse performance than 2-PAM and 2-PPM, respectively. 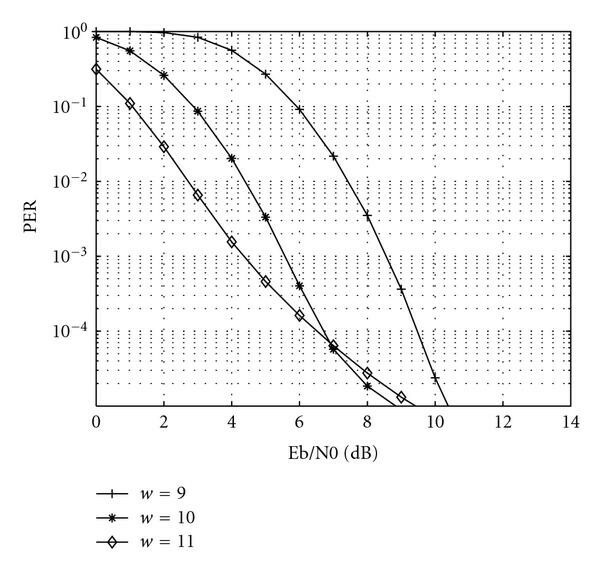 With the increase of the modulation level to L = 4, PIM has a 0.8 dB better performance than 4-PAM and 3 dB worse than 4-PPM, while for L = 8 PIM performance is 7 dB better than 8-PAM and 3 dB worse than 8-PPM. Generally, it can be seen that if the modulation level increases, PIM and PPM performance increases while PAM decreases significantly. PER performance comparison of PAM, PPM, and PIM for the same bit energy. To compare PIM with PPM for the same average power per symbol, equations (18), (24), (25) and (26) are used. Packet length is chosen to be B= 512 bits, w = 1 and Results are shown in Figure 7. In the simulation the number of modulation levels is L= 2, 4, 8. 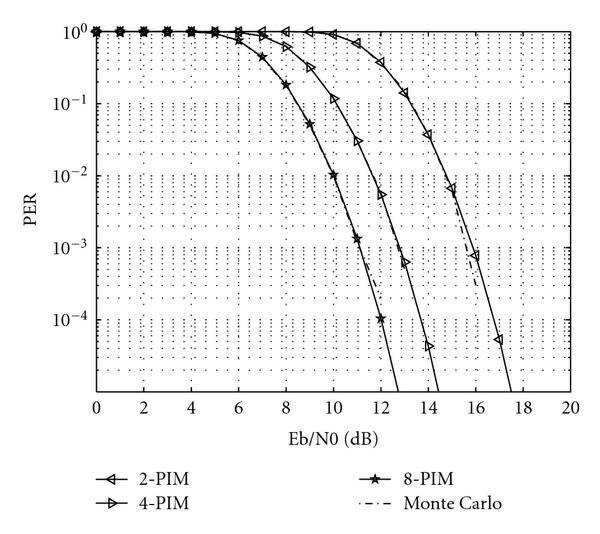 In the case of L = 2, PIM has a 4 dB lower PER than 2-PPM. With the increase of the modulation level to L = 4, 8 PIM performance decreases compared with PPM. PER performance comparison of PPM and PIM for the same average power per symbol. Figure 8 shows the influence of the threshold level on the PER performance for 8-PIM when the code weight is w = 10. It can be seen that the optimal threshold is at It results from the fact that in an 8-PIM symbol there is only one chip where a pulse occurs and on average 4.5 empty chips, so the probability that a false pulse will be detected is higher than the probability that a correct pulse will not be detected. Influence of the v th level on 8-PIM performance with code weight w = 10. Figure 9 shows the influence of the code weight w on PER performance for 8-PIM with set to an optimal value. It can be seen that 8-PIM with w = 11 has a slightly better performance than 8-PIM with w= 10, and 2.3 dB better than 8-PIM with w = 9. 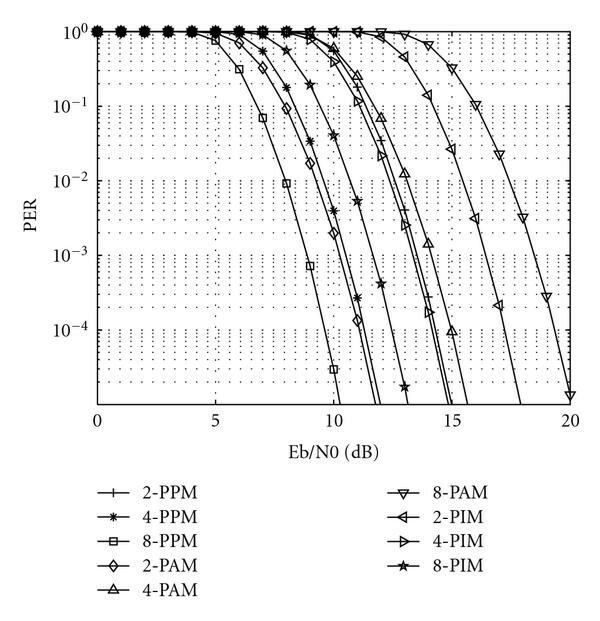 Figure 10 shows the influence of the threshold level on PER performance in the presence of the MUI for 8-PIM when the code weight is w = 10 and dB. It can be seen that for the optimal threshold the PER performance improves significantly. 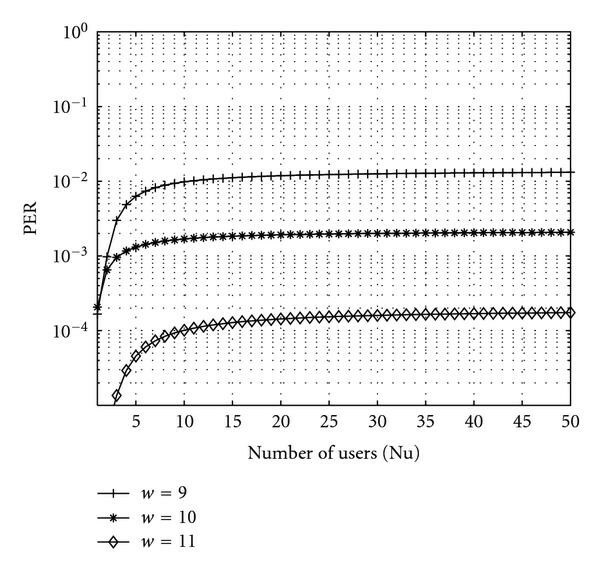 Influence of v th on 8-PIM PER performance when the number of users increases, for w = 10. and E b /N 0 = 10. = 15 dB. Code weight w influence on 8-PIM in presence of the MUI for optimal is analyzed and shown in Figure 11. It can be seen that with an increase of code weight, PER is improved, which is a result of more correlated pulses at the receiver. This advantage is at the cost of the data rate shown from (6) in Figure 11. 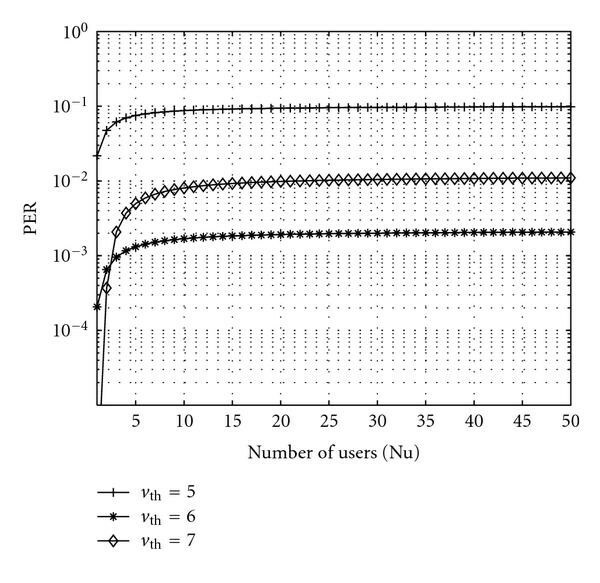 Influence of the number of users on 8-PIM performance for optimal v th and E b /N 0 = 10. = 15 dB. 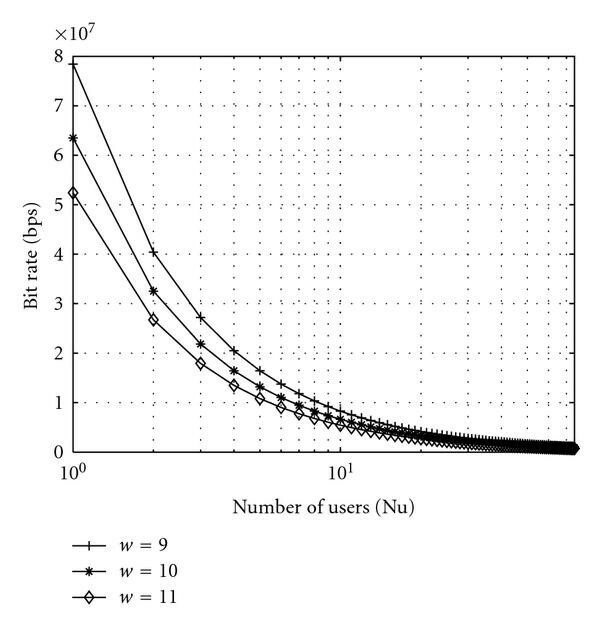 Influence of the number of users on the bit rate for 8-PIM and T c = 1 ns. This paper proposes an anisochronous PIM scheme for IR-UWB communication systems. The basic principles and characteristics of anisochronous PIM scheme are outlined. Unlike PPM, PIM requires no symbol synchronization, which results in a much simpler receiver structure (only one correlator). The proposed multiple access method based on SOOC-TDL-CDMA allows a totally asynchronous transmission and it needs only chip synchronization which significantly reduces hardware complexity, while classical time-hopping IR-UWB needs both frame and chip synchronization which increase hardware complexity. It is shown that an increase of code weight can decrease PER at the cost of hardware complexity (more delay elements at TDL) and the influence of in both single- and multi-user environment is analyzed. The major disadvantage of anisochronous PIM techniques is that they have a variable symbol length, and hence the time required to transmit a data packet containing a fixed number of bits is not constant. Employing some form of a source coding scheme, packet length variation can be limited still maintaining the increase in information capacity over isochronous modulation techniques. Simpler receiver complexity and very high achievable bit-rates make PIM modulation very attractive for IR-UWB short-range communication systems.